Certain foods are often to blame for acne. However, according to the Acne website, there is no scientific proof that unhealthy food can make your skin break out. Still, there are specific healthy foods, including almonds, which benefit your skin health and can help prevent or even reduce your acne. Make sure that you stay within the serving limit in order to prevent adverse effects. According to the WH Foods site, a quarter-cup of almonds contains nearly half of your daily value of Vitamin E and manganese. Almonds also provide high levels of magnesium, riboflavin, tryptophan, copper and phosphorus. Almonds, like other nuts, are considered a healthy snack in moderation. Almonds can help your acne by improving the condition of your skin. 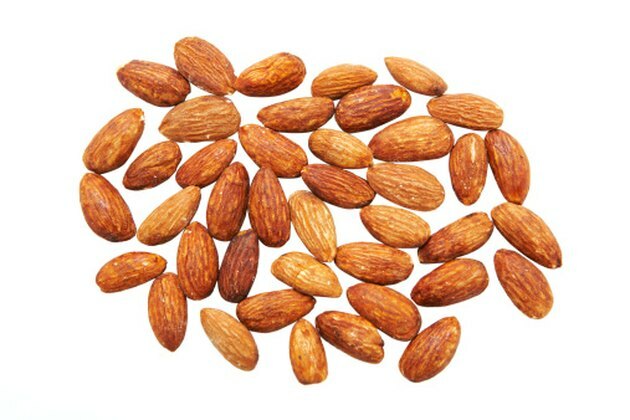 According to the Acne website, the Vitamin E contained in almonds helps guard your cells against free radicals. Pollution and harmful bacteria are examples of free radicals. Combined with the natural sebaceous oils produced from your pores, the combination can result in pimples, blackheads, and even white heads. Antioxidant-rich foods like almonds help keep free radicals at bay. Some people fear eating nuts like almonds, since they contain high levels of fat. However, the WH Foods website explains that almonds contain healthy monounsaturated fats which help promote weight loss, prevent weight gain, and help lower LDL cholesterol levels. There is also a misconception that fatty foods worsen your acne. Although almonds contain healthy fats, no fatty foods in general actually worsen your acne. The only exception is if the fat accidentally comes into contact with your skin externally. This may occur from grease spatters while frying foods. Although almonds are a healthy food, you want to keep your daily servings small, as they are high in calories. According to WH Foods, a quarter-cup serving contains approximately 205 calories. With this being the case, you do not want to consume more than this per day. Even healthy foods can have high amounts of calories which can eventually lead to weight gain. Make sure that you enjoy almonds in moderation. Although almonds can help your skin stay clear, it is important that you eat other foods which promote healthy skin. Experts at the Acne website recommend that you eat foods, such as leafy green vegetables, eggs, whole grains, milk, fish, carrots and cantaloupe, in conjunction with nuts like almonds. Eating almonds alone will not prevent acne, especially if the rest of your diet is poor. Also, make sure that you drink water throughout the day in order to keep your skin hydrated.